Most COMPLETE and COMPACT Air/Oil Separator on the market! Patent Pending! 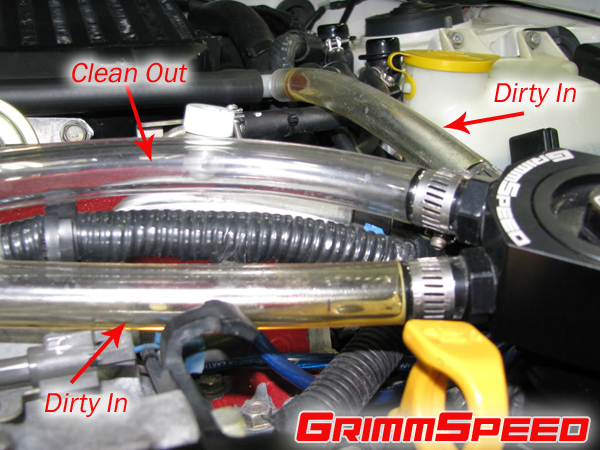 The GrimmSpeed™ Air/Oil Separator for Subaru vehicles has a unique patent pending design that allows you to maintain your PCV Valve while separating the oil out of the crankcase and head ventilation air! Our AOS will allow your engine to run more efficiently due to the separation of oil from the intake system. When there is oil in your system, the result is 1) reduced fuel octane 2) higher chance of engine knock(detonation) 3) worse emissions 4) higher oil consumption. Our Air/Oil Separator will help all of these problems. In typical GrimmSpeed™ fashion, we have made a very compact unit that packs a powerful punch(and looks good while doing it)! Please note this product is designed to combat factory amounts of blow by. If you have a built motor or are experiencing abnormal amounts of oil consumption, this product may not work for you. Q: Is this beneficial on a street car? A: Yes. Even in stock form, you will experience oil going through your intake system. If you have ever looked in your intercooler piping you will notice a bunch of oil build up on the inside, our AOS takes care of this problem. Q: I've heard about the milky oil substance in cold climates when using an AOS, is that relevant? A: During our testing here in the frozen tundra of Minnesota we have only noticed very minimal milky substance from the AOS. Condensation is allowed to collect on the inside of the core but will evaporate when the engine gets up to running temps. Q: Why choose the GrimmSpeed™ AOS over other AOS products? A: The GrimmSpeed™ AOS allows you to separate the vapors from both the heads and the crankcase. Others on the market only allow you to separate the vapors from the head. Also, our AOS allows you to retain the OEM PCV Valve. Being that it allows you to do both of these things at the same time makes it the most complete AOS on the market. Q: How will this AOS increase my octane? A: When the oil vapors are mixed into the intake system, it effectively lowers the octane which can cause detonation. Installing our AOS will eliminate the oil vapors in your intake system thus eliminating the loss of octane. On modified cars this let's you get more aggressive with your timing/boost maps and will allow you to make more power! Q: Do I need to carry around a 19mm socket to open it? A: No, we have sized the cap nut to be the same size as a lug nut. So as long as you have a tool to take your lug nuts off(which you should always have in your car), you will have a tool to open the AOS. On a proper running system you shouldn't need to open the AOS very often. A: We created it so it will work perfectly with a FMIC as well. The body of our AOS as the same diameter as the oem oil cap. Q: What models will this fit?